The Department of Health and Human Services recently released rules for creating electronic health records. 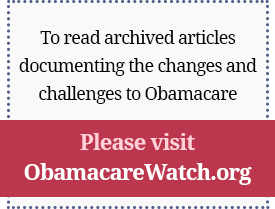 These rules came days after HHS issued regulations to safeguard the privacy of medical records. This digital revolution could dramatically improve medical care. The RAND Corporation estimates America could save $77 billion a year with health information technology (HIT). But policymakers must remember the interests of doctors and patients. If they don’t, HIT could increase costs, hurt medical care and infringe on the doctor-patient relationship. Health care providers have slowly digitized their medical records. According to HHS Secretary Kathleen Sebelius, “only 20 percent of doctors and 10 percent of hospitals use even basic electronic health records,” although according to some studies, the numbers may be double that. Those requirements initially were so onerous few providers could meet them. Kaiser Permanent, an early adopter of electronic record-keeping, couldn’t meet the requirements. President Barack Obama often praises Utah’s Intermountain Healthcare for its integrated information systems, but even Intermountain couldn’t meet 75 percent of the criteria. HHS has since amended its requirements to make it easier to comply. But how will others fare with the newly relaxed rules? Providers must meet the HIT requirements by 2015. Those that miss the deadline will lose subsidies and face financial penalties. The government is essentially forcing doctors and hospitals to upgrade their technology systems without providing financial support. Consumers will likely pay for the upgrade. Providing doctors with more easily accessible data could help them make better decisions for their patients. But this is the key: Doctors must still be the ones making the decisions. Unfortunately, access to “meaningful use” information may allow government officials to steer doctors toward cost-effective — instead of health-conscious — treatments or practices. This has already happened in California’s Medicaid program. State officials limit physicians’ ability to prescribe drugs, often forcing them to prescribe cheaper medicines before moving to newer, more expensive ones. Doctors must wade through paperwork to get clearance to prescribe drugs that may not be on the state’s approved list. Federal officials may also urge doctors to skip certain tests. This has already happened. In late 2009, an HHS task force revised its guidelines for mammograms. The panel said most women should wait until age 50, and then only get a screening every other year rather than the current practice of starting annual exams at 40. Only after a public outcry did the government soften this position. Embracing HIT could improve medical care. But doctors, not government officials, must use the information to plan the best treatment for their patients. As our health sector moves into the Information Age, it’s crucial that we remember the central importance of the doctor-patient relationship. Published in The Oklahoman, August 28, 2010. Next Article: Pro & Con: Will health overhaul provide better care for U.S. workers?